Preheat the oven to 450F. Combine the breadcrumbs, parsley and garlic. Heat 2 tsp oil over medium-high heat in a large skillet. Add the breadcrumb mixture and cook until golden brown (about 3 minutes) stirring often. Grease 4 small gratin dishes with the remaining oil and arrange the shrimp in a single layer over the bottom. Season shrimp with a bit of salt and pepper. 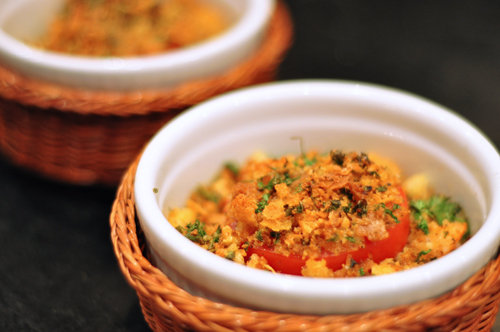 Sprinkle ½ cup of the breadcrumbs over the shrimp and top with tomato slices. Cover with the remaining breadcrumbs and season with a bit more salt and pepper. Melt the remaining 2 tsp of butter and drizzle over each gratin. Bake at 450F until the shrimp are completely cooked (about 12 minutes). Drizzle each gratin with 1 tsp vinegar before serving. We love the flavor of balsamic vinegar and how well it goes with seafood. The individual gratins are perfect for portion control too. You’re definitely right about the food cravings changing with the seasons. Even if I still want pasta, I want it with fresh sweet peas or asparagus, not the heavier creams and winter vegetables. I love the combination of the shrimp and tomato. Those crumbs on top are gorgeous and would add the perfect crunch. Shrimp and pasta sauce is one of my favorite combinations. I love this spin. A bit more classy I must say. Great for a dinner party! What a great idea – this look perfect! And anything that comes in individual servings, is just cute! Wow this is beautiful! I love that you used individual ramekins and I love the breadcrumbs on top too. Yum! 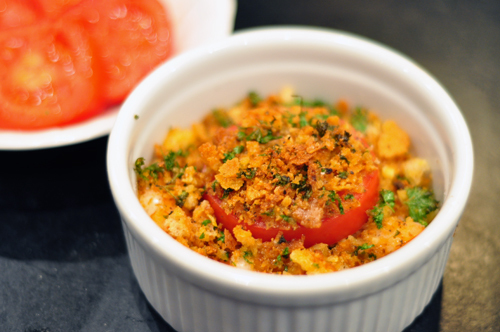 I love baked tomatoes and that its in individual ramekins (I need the portion control). I need to try this soon! This sounds great. Finally we have some tomatoes here that don’t look like plastic, so I’m cooking a lot with them. Oh, and I love balsamic vinegar! Great recipe. This looks delicious! I like that it’s also healthy and seems to be quite filling too. This does sound great for summer! The balsamic drizzle sounds delicious too, and I love your ramekin holders. What a great dinner – I happen to have shrimp ready to be used! Looks wonderful!